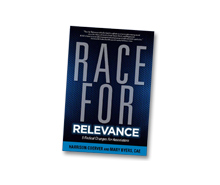 A new ASAE publication entitled Race for Relevance offers reasons and a workable guide for introducing radical changes in associations. Why? “Radical change, rather than incremental change, is necessary because the environment has changed considerably, and associations have not kept pace. There are six marketplace realities … that have irreversibly changed the playing field for membership organizations: time, value expectations, market structure, generational differences, competition and technology.” The authors Harrison Coever and Mary Byers, CAE, elaborate the consequence of each. The book espouses five radical changes, beginning by insisting that competency-based boards consisting of five people work best, and that associations should implement one radical change at a time. It walks the reader through the best ways to overhaul governance models, including committees. It confronts the traditional roles of staff versus volunteers and then launches into a full-on attack of traditional thinking about how to provide value by rationalizing the member market, programs, services and activities. It concludes by providing advice on how to bridge the technology gap and build a new association framework for the future. Zeroing in on the products and services that reflect your mission and those you can deliver consistently and effectively. Case studies to better understand the benefit of the proposed radical changes. In summary, the 152 pages of thought-provoking ways to rethink how your organization can best succeed in our changing environment can stimulate insightful discussions between staff and volunteers. That, in itself, is reason to read the book. Reviewed by Paulette Vinette, CAE, FASAE. Paulette is President of Solution Studio Inc., a consulting firm dedicated to providing strategic support and interim leadership to not-for-profit organizations. She can be reached at [email protected].